Want $20 back from Whole Foods when you use your AmEx card? 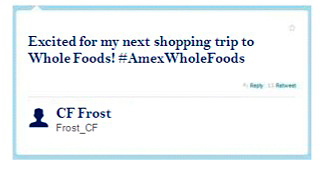 Tweet #AmExWholeFoods. Here’s what’s behind the new deals for the sharing generation. Today, American Express unveiled a new program with Twitter to let cardmembers sync accounts with the social network, and earn savings from big brands such as Whole Foods, Best Buy, and Zappos–just by retweeting certain hashtags. With the partnership, AmEx helps fortify its role as the credit card for the social media generation–and, apparently, following through on the whole Social Currency idea beyond offering membership points rewards. In addition to its partnership with Twitter, the company, which boasts more than 90 million cardholders worldwide, has already rolled out a national program with Foursquare for check-in deals and Facebook for rewards through Likes. AmEx aims to be the connective tissue between merchants and consumers on social media that will provide a mix of offers, data, and branding to its members. 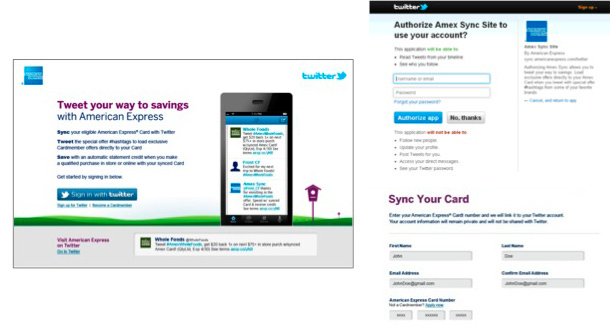 As with Foursquare, the process of syncing your AmEx account to your Twitter account is a quick, one-time process. Once linked, U.S. cardholders have the opportunity to earn rewards by tweeting special offers from hashtags. 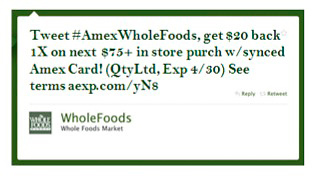 “Tweet #AmExWholeFoods, get $20 back 1x on next $75 in-store purchase,” Whole Foods might tweet. 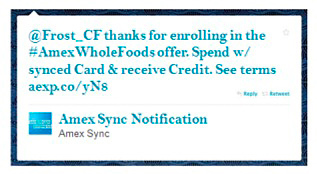 Once the consumer tweets the #AmExWholeFoods hashtag, the offer is automatically loaded into that member’s account, ready to be redeemed effortlessly the next time he or she shops at Whole Foods. It’s a social strategy AmEx has used to take the friction out of the point of sale, and turn something as simple as a hashtag into a potential future transaction. It’s also a social strategy we should expect AmEx to continue to pursue beyond Facebook, Foursquare, and Twitter.